These are the original directions that came with a clear plastic box and papers. You do not need any special plastic box as any small clear box can be used. If you already own the more expensive Glass Box Revisited ebook then you already have most of this information as most of this was reprinted in that ebook. Back in 1986 Devin Knight who performed as a professional psychic shocked the world with a headline prediction that involved the Newfoundland plane crash that killed over 200 people. The prediction had been held by a state senator. News of this went worldwide and the story was carried in over 2000 newspapers. In the history of magic NO HEADLINE prediction had ever garnered this much attention. The closest thing was the Robert Nelson Prediction of the Ages but even it didn't come close to TV, radio, and newspaper that this prediction made. Even to this day magicians and mentalists still talk about the 1986 prediction. It made magic history. 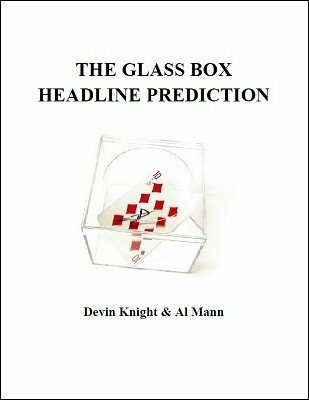 All this caught the attention of the renowned mentalist Al Mann and as a result he and Devin became close friends and worked on improving headline predictions to make them even better. Al Mann wrote a book called the Incredible Feats of Jason Michaels and teased mentalists with the effect but refused to tip the secret. Part of Devin's method was revealed in the rare Al Mann glass box manuscript of which only a handful are known to exist. Devin sold his original copy on eBay for $600.00 a few years ago. The methods included are ADVANCED glass box techniques that Devin and Al Mann secretly developed and Devin used to fool reporters around the world. This information goes far beyond the original glass box manuscript and describes some of magic's closest guarded secrets. Mentalist arrives at a VIP, hopefully a high government official with a small clear plastic box. Inside the box are 3 slips of paper, each seen to be separate from the others. The slips are of different colors and folded. The clear box is sealed with tape and the VIP signs his name on the tape so the box can't be tampered with. He keeps this box in his possession and TRUTHFULLY, neither the magician nor secret assistant ever touches the box again, even during the show! On the day of the show, the clear box is opened and the predictions inside are read and correctly predict the headlines. The best headline prediction ever created! This original sold for $75 with these directions and a clear box. With this release you get a PDF with full details. Use your own clear box. Get this information for a fraction of the original cost.